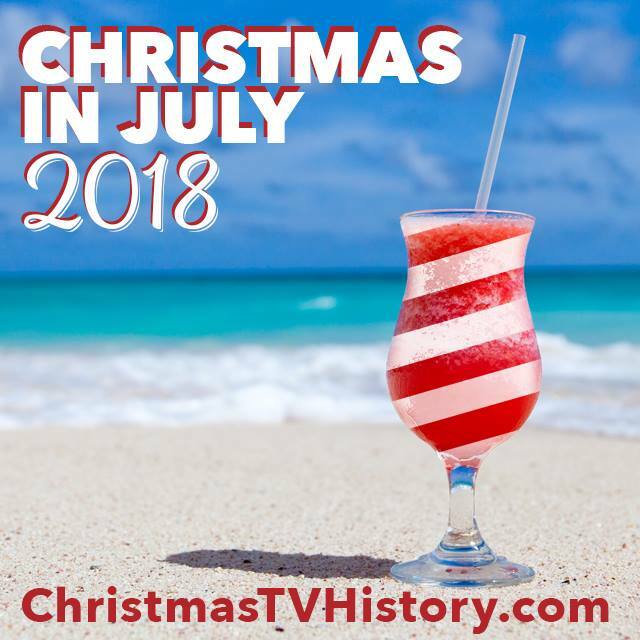 Hopefully you've been following along the last several weeks as I've been reminiscing about some of the best and most interesting film and TV adaptations of O.Henry's popular Christmas short story The Gift of the Magi. 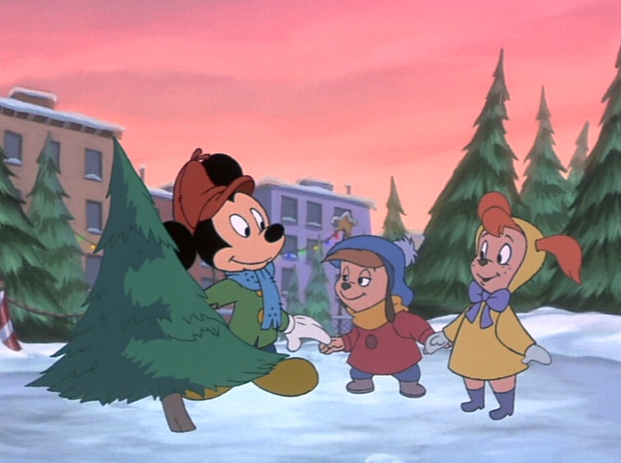 So far I've discussed the 1952 film O.Henry's Full House, the 1978 TV movie The Gift of Love, a segment within 1999's Mickey's Once Upon a Christmas, and 1977's Emmet Otter's Jug-Band Christmas, the 1996 Finnish-made operatic version The Gift of the Magi, and the 1979 sitcom version on Alice. 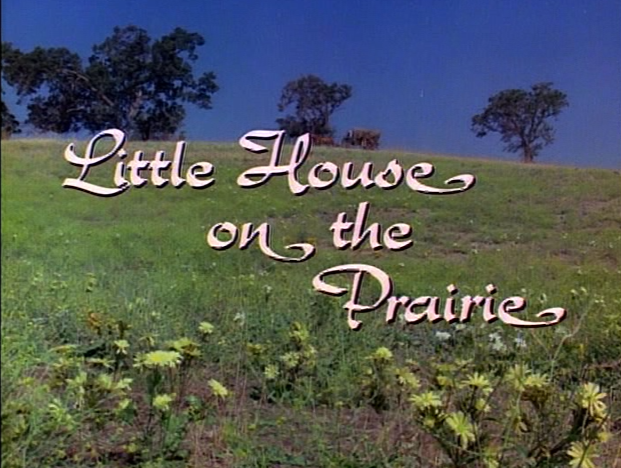 Another outstanding TV adaptation was made in 1974 on the pioneer/western drama Little House on the Prairie. 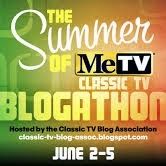 Please don't tell me that you've never seen this classic first season episode!? 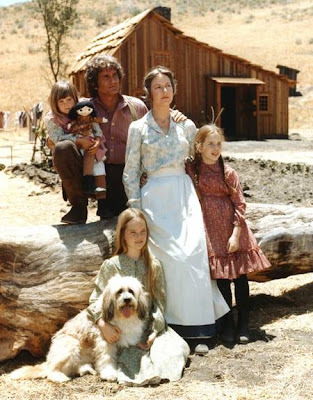 The Ingalls family (left to right) baby Carrie, Pa (Charles), Ma (Caroline), and Laura. Seated is oldest daughter Mary with the family dog. 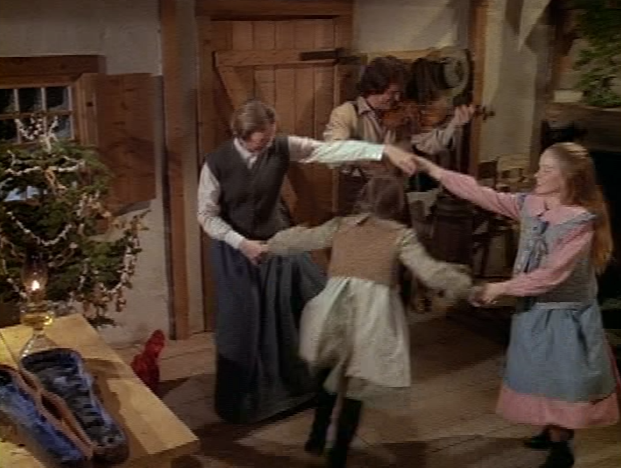 In the first season episode entitled "Christmas at Plum Creek," each member of the Ingalls family works hard and makes great sacrifices in order to get gifts for the others. Though none of them has much money, they each have the desire to make this first Christmas in their new home a special celebration. Mary spends weeks working with seamstress Mrs. Whipple to learn how to sew a new shirt for Pa.
Charles spends long nights working in the barn rebuilding a set of four wagon wheels to sell to Mr. Oleson. The oldest daughter Mary decides to take on an afterschool job working with the town's seamstress. Ma begins to sell more of her chickens' eggs to the Oleson Mercantile to raise additional monies, and Pa offers to re-build a set of buckboard wheels that Mr. Oleson says he'll buy. Everyone is busy planning on a special Christmas--everyone except Laura who can't figure out a way she can earn any money. The Ingalls family Christmas includes Pa playing Christmas music on his fiddle while the girls dance in front of the fireplace. Though the story unfolds slowly, in the end it becomes clear what has happened. 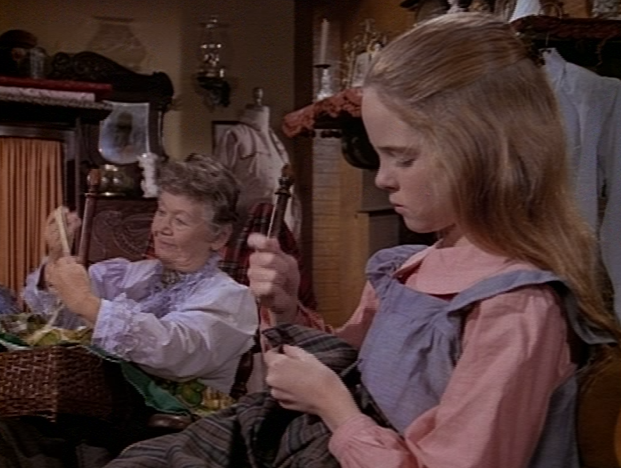 On Christmas morning as the family opens their gifts, we see that Laura has knit her father a scarf, Laura is given a horse saddle from her father, Mary receives a rabbit fur cape made by her parents, and Pa receives a hand sewn shirt from Mary. Surprised by her daughter's gift, Caroline hides the handmade shirt that she has sown for Charles--so as not to lessen Mary's gift. After Pa sells his wagon wheels, he tries to use the money to buy Ma the stove she wants. When Charles is told that the stove is already sold, he has no gift for his wife. 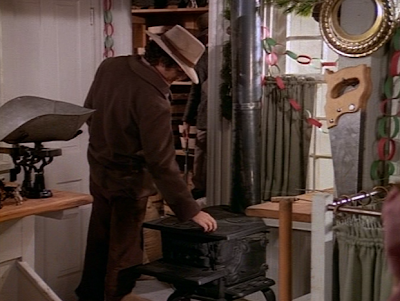 Then Caroline opens the crate that was delivered to the home--it's the iron stove that she wanted. The attached card says that the expensive gift is from Laura! Caroline and Charles are more than surprised--but a knock at the door answers all their questions. 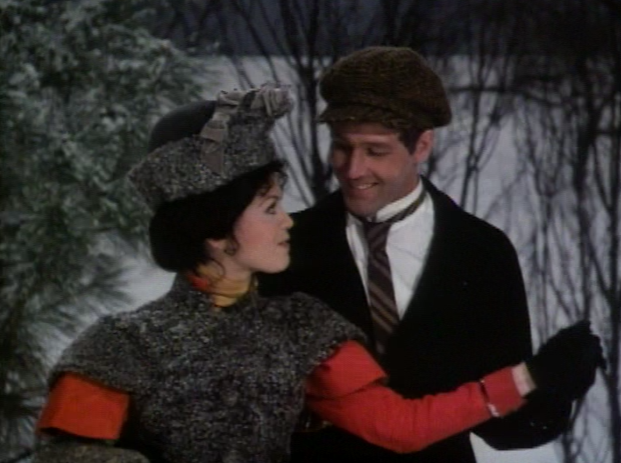 Mr. Oleson and Nellie knock on the door Christmas morning. Mr. Oleson has come to collect Laura's most treasured possession, her horse Bunny. 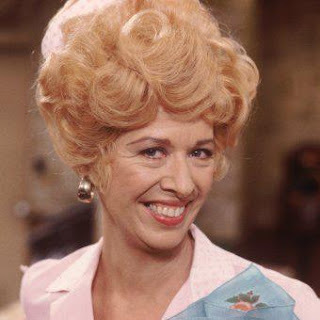 Laura sold Bunny to her least favorite person Nellie Oleson, in exchange for the stove for Ma. Charles tells Caroline "She loves you. Don't spoil it for her." 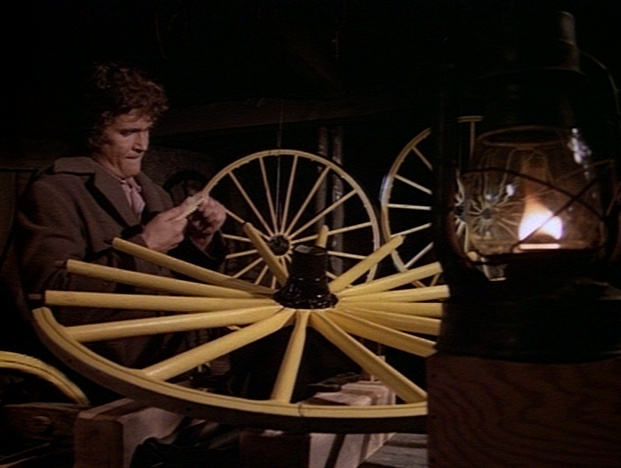 Though Caroline doesn't want Laura to sell her horse for a stove for her, Charles urges Ma to accept the gift in the spirit in which it was offered. 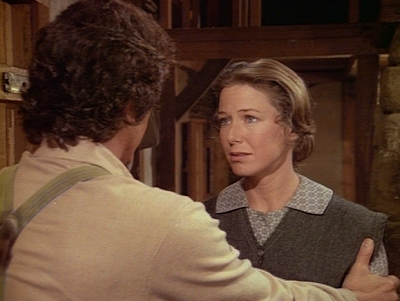 Pa comforts Laura by telling her that maybe she'll get another horse in the future. After the Olesons leave, Laura begins to cry and not because her beloved horse is gone but because Pa spent so much time making her a saddle for it. At this point in the story, unless you're made of stone, you'll find yourself crying along with all the members of the Ingalls family. It's a very heartwarming story, to say the least. There's one last Christmas gift to open--baby Carrie reminds them that she has a gift to give. After finding a penny, she has gone to the store to buy a gift for Baby Jesus. 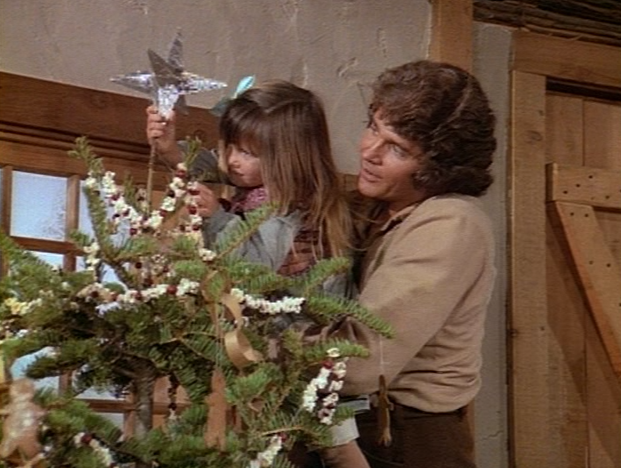 It's a shiny star ornament for the top of the family's Christmas tree. Pa helps Carrie put her star on top of the tree. 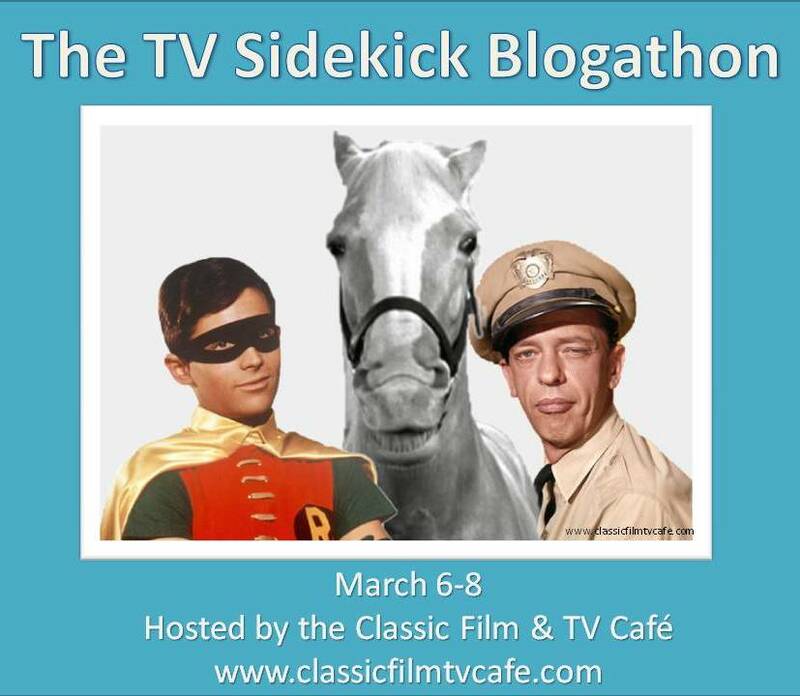 Not only does this western drama take on story elements from O.Henry's classic story The Gift of the Magi--Pa gives Laura a saddle for a horse that she sells for the money to buy Ma an iron stove. But "Christmas in Plum Creek" emphasizes a different dimension to giving gifts as well. Here, Caroline puts away her handmade shirt to Charles to protect her daughter's feelings when Mary makes Charles a shirt. Charles gladly embraces Laura when she feels badly about all the effort he put into getting her a saddle for the horse she sold. And, Caroline loves her daughter enough to allow her to make this big sacrifice (selling her horse) to show her mother how much she loves her. Where's that box of tissues? Are you a Little House on the Prairie fan? There are several more Little House Christmas episodes--is there one you like more than this one? 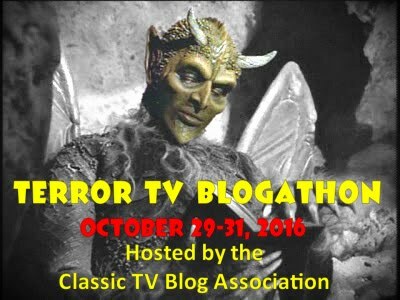 Remember this series' theme song? It was sung by Linda Lavin--the actress who played Alice. But you knew that, right? 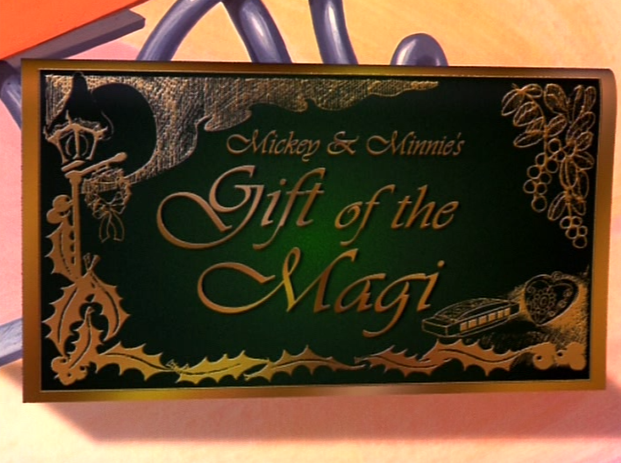 I'm still continuing my discussion of memorable adaptations of the Christmas short story The Gift of the Magi, written by American author O.Henry. 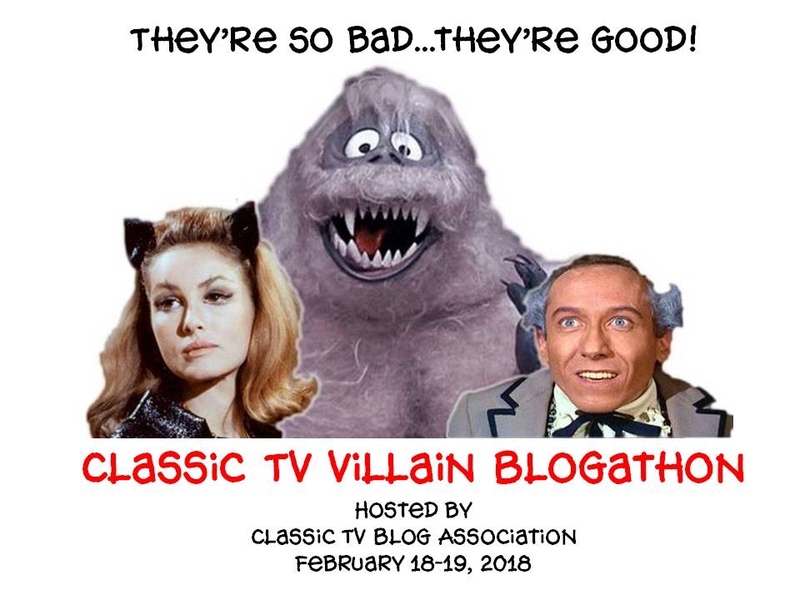 So far I've discussed the 1952 film O.Henry's Full House, the 1978 TV movie The Gift of Love, a segment within 1999's Mickey's Once Upon a Christmas, Jim Henson Production's 1977 hit Emmet Otter's Jug-Band Christmas, and the 1996 operatic TV version from Finland entitled The Gift of the Magi. While there are dozens--yes, dozens--of TV sitcom versions of The Gift of the Magi, I thought I'd remind you of one of my favorites. 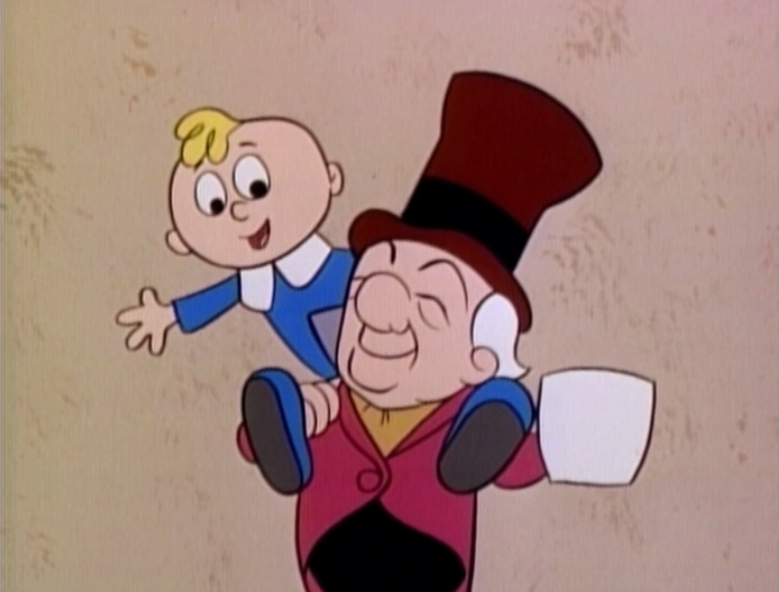 As a former child of 1970s and '80s TV, this fourth season episode of Alice entitled "Mel, the Magi" is one I've seen over and over. 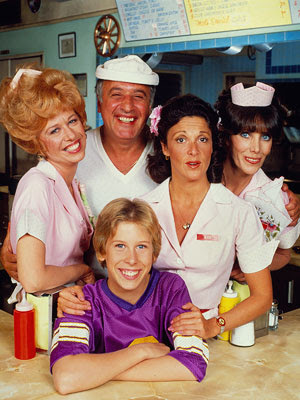 This fourth season story revolves around the waitresses Flo, Alice and Vera, cook and owner Mel Sharples, and Alice's son Tommy. 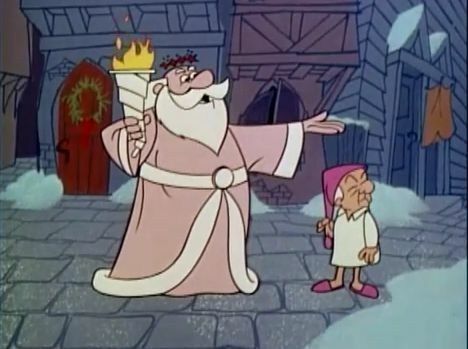 In this 1979 Christmas episode, there is more story than just The Gift of the Magi plot line. The waitresses decide to hold their Christmas Eve party at Mel’s diner and invite all their regular customers. On Christmas Eve, the lights on the Christmas tree short out the diner's electricity and Mel desperately calls every electrician in Phoenix. Eventually a man in a Santa suit arrives and he fixes the wiring. 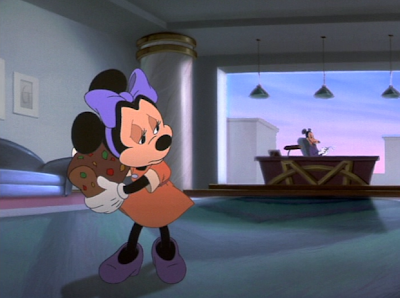 But when the waitresses' Christmas gifts from the back room turn up missing, Flo calls the police. The police begin combing the neighborhood for suspicious men in Santa suits who may be in possession of their gifts. 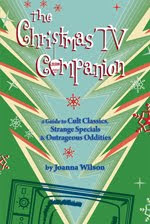 There's also a subplot about the child-like Vera believing that the electrician in the Santa suit is the real Santa. 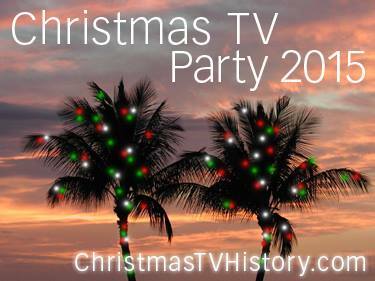 What we've seen earlier in the episode is that the waitresses have all agreed to buy one and only one gift for each other this year--Alice is going to buy for Tommy, Tommy for his mother Alice, Flo will buy for Vera, and Vera will get a gift for Flo. Mel says he's been saving all year for one gift for himself: a new color TV. 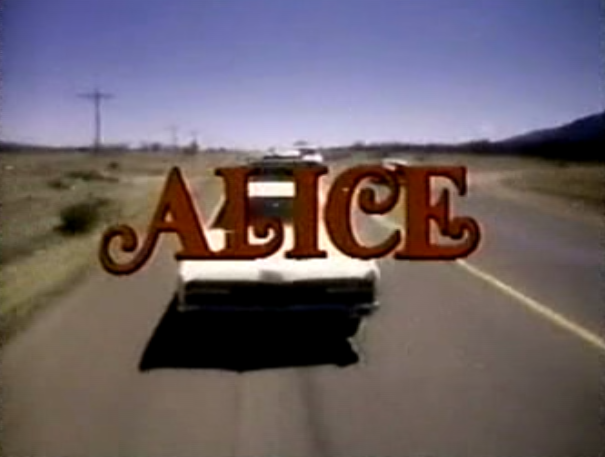 However, with prices on the rise, Alice ends up pawning her silver coffee pot to buy Tommy a case for his guitar, Flo hocks her velvet painting of Johnny Cash to buy Vera a collection of Burt Bacharach LPs, Vera pawns her record player to buy a leather picture frame for Flo’s favorite painting of Johnny Cash, and Tommy sells his guitar to buy his mother a silver creamer to match her coffee pot. Only Mel and the regular customer Henry are aware of the sacrifices made by the thoughtful gift-givers for one another. 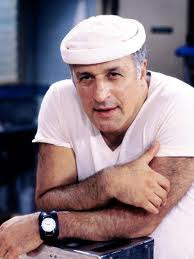 Mel, played by Vic Tayback, is usually characterized as being frugal. 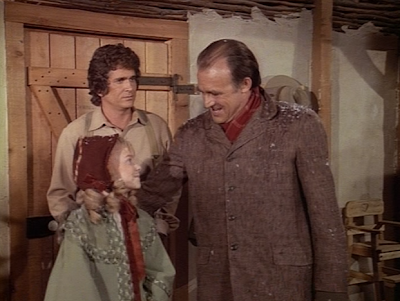 However in this Christmas episode, Mel is charmingly generous. On Christmas Eve, one of the suspicious men in a Santa suit brought into the diner by the police is Mel Sharples--and he has all the waitresses' gifts! Turns out Mel has gone around and bought back all the pawned items. Now Flo has the velvet painting and its frame, Alice receives a creamer and her coffee pot, Tommy has his guitar back and a case for it, and Vera gets her record player back and a set of Burt Bacharach albums. Sorry, I couldn't get a photo of Flo's oil painting of Johnny Cash on velvet. Every Johnny Cash painting needs a frame. This episode may be predictable but it’s a satisfying adaptation of O.Henry’s classic tale. 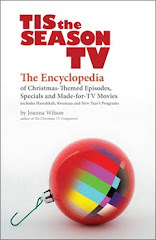 To me, this is a great version of The Gift of the Magi because Mel knows his friends are spending beyond their budgets for Christmas but he ends up embodying the spirit of Christmas, sacrificing his own color TV set to buy their gifts back. Since Mel treats his waitresses so poorly most of the year, it's nice to see him go out of his way for them at the holidays. 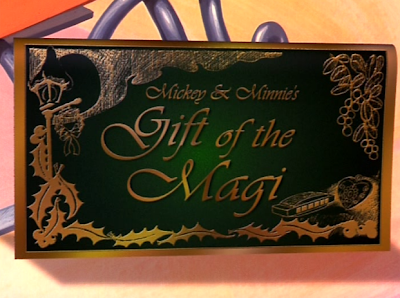 Can you name one of the dozens of other sitcom adaptations of The Gift of the Magi? Which is your favorite? Don't avoid this foreign language version--the DVD version includes English subtitles! 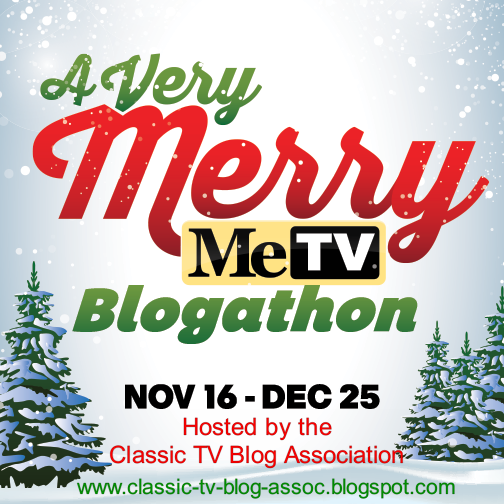 Hopefully you've been following along the last several weeks as I've been reminiscing about some of the best and most interesting film and TV adaptations of O.Henry's popular Christmas short story The Gift of the Magi. 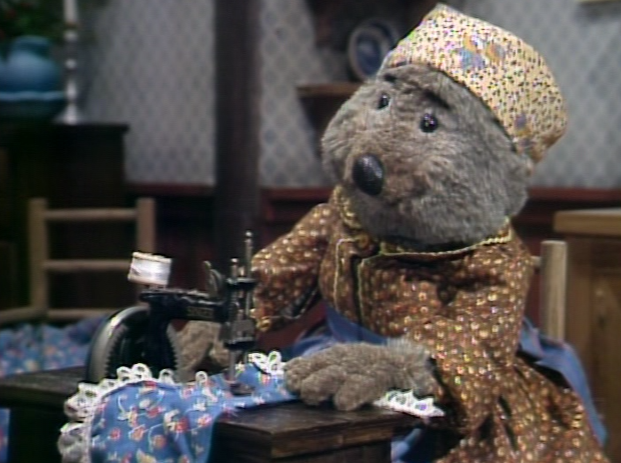 So far I've discussed the 1952 film O.Henry's Full House, the 1978 TV movie The Gift of Love, a segment within 1999's Mickey's Once Upon a Christmas, and 1977's Emmet Otter's Jug-Band Christmas. Another outstanding TV adaptation is the 1996 operatic version made for Finnish TV, simply titled The Gift of the Magi. 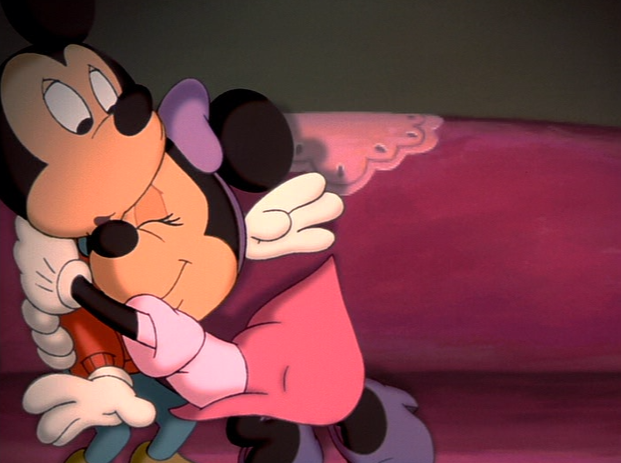 In this version, the original character names of Jim and Della have been replaced with Joel and Minna. Doesn't Joel look like a younger Tim Robbins? This opera version of the Christmas story lifts the emotional drama of the familiar tale to new heights. Much like the original story, a young couple Joel and Minna are short on money at Christmas time. In this version, through song, we also learn that Joel is also struggling to pay their rent. 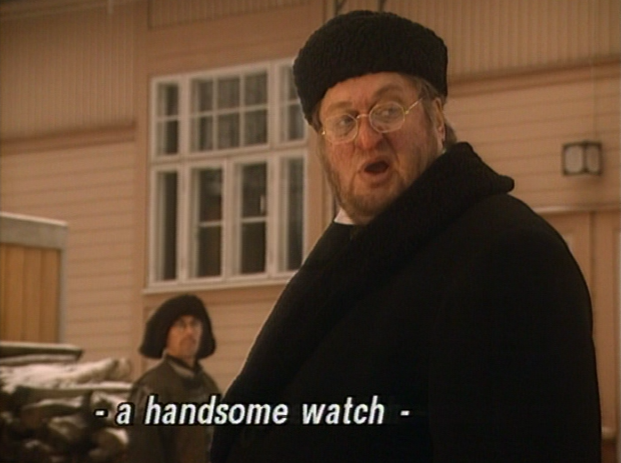 The landlord Mr. Salomon adds tension to the story as he pressures the young couple to pay their rent, stopping Joel outside the apartment to admire his valuable heirloom watch. The landlord Mr. Salomon clearly wants to acquire Joel's valuable watch. Another character, a woman of loose morals known in the small village as The Queen of Sheba adds another voice to the unfolding story. The Queen’s song puts Minna's struggle in context, explaining that a woman’s beauty is her asset and to jeopardize her value is to risk losing her man and her status in society. Though she's an outcast in the community, the Queen of Sheba (a prostitute) has a worldly understanding of men and society. Although Minna doesn’t like The Queen, she knows cutting off her hair certainly jeopardizes how her husband may value her especially since they are newly married and the relationship is still young. 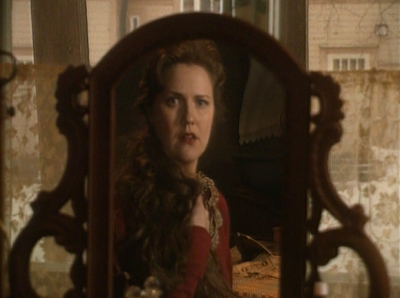 Minna gazes in the mirror and considers selling her hair--her only thing of value. 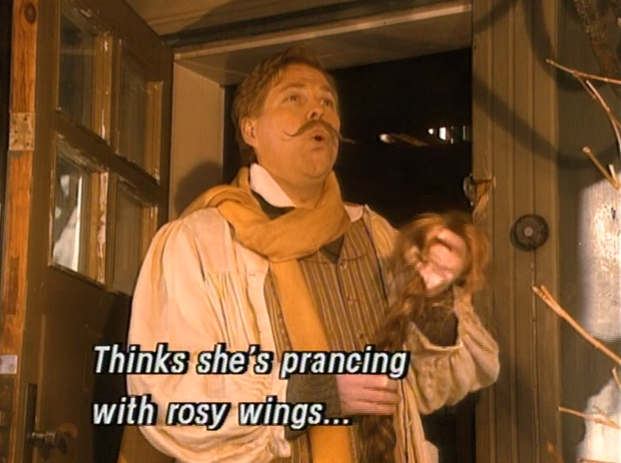 A third character, the wigmaker adds his perspective in song to this timeless story. At first the wigmaker expresses his contempt for Minna’s faith in the power of love and her sacrifice. But as the wigmaker hears his own cynical remarks about love, he’s moved to follow after Minna to see if her ultimate gift does indeed impress her husband. 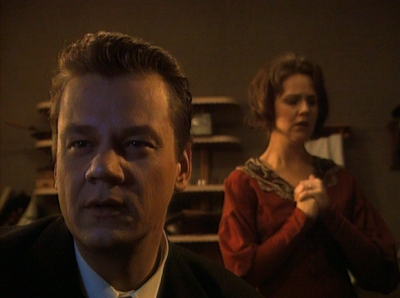 The wigmaker doubts the power of love but wants to see for himself what happens when Minna and Joel exchange gifts. In the end, the townsfolk who have watched all day as these dramatic events unfold now gather and stand outside the young couple’s home to watch through the curtains in the front windows to marvel at the most precious gift exchange. 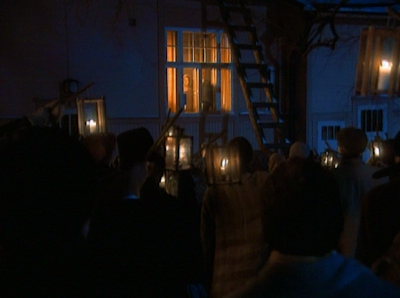 Knowing full well what's been going on, the villagers all watch the windows to see the couple's reaction. Interestingly, this TV version also takes the story another step to connect this gift exchange between Minna and Joel with the gifts the three magi offered the baby Jesus. 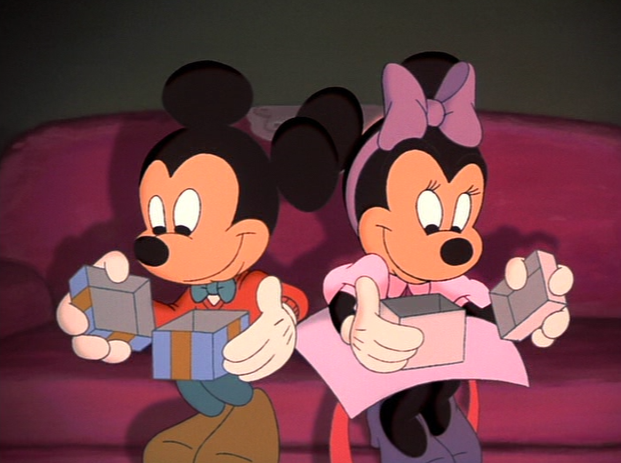 The scenes in which Joel and Minna exchange gifts are framed with captions that remind viewers of the first Christmas gifts: gold, frankincense and myrrh. It's a thoughtful reminder of the spirit of the season. 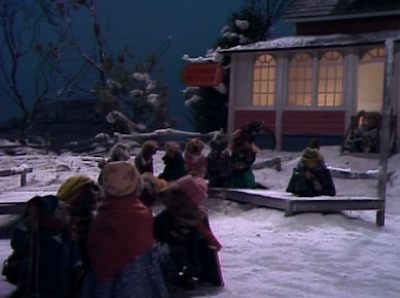 The townsfolk watch as Minna's and Joel's precious gifts are offered. 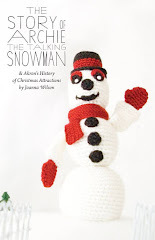 The framing element connects the biblical Christmas story to this tale about giving. Though the opera's lyrics are in another language, the visuals and the subtitles clearly communicate the beautiful Christmas story and the power of giving one’s only possession. This hour-long opera performance does not take place on stage in a great opera hall but rather is shot on sets--many of them out of doors. The result includes close-ups and a variety of camera angles which helps create a more intimate viewer connection with the performances. Like only opera can do, the emotional highs are higher and the lows are a lower in this classic Christmas tale. Here, Minna prays that her husband doesn't reject her for sacrificing her beauty for him. 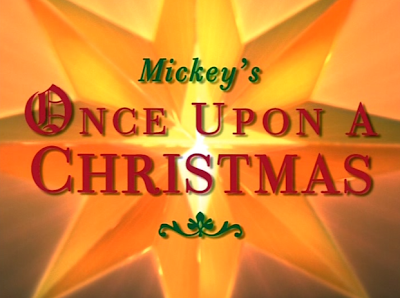 This musical adaptation is certainly different from much of the made-for-TV Christmas entertainment--and that's why I'm drawn to it. 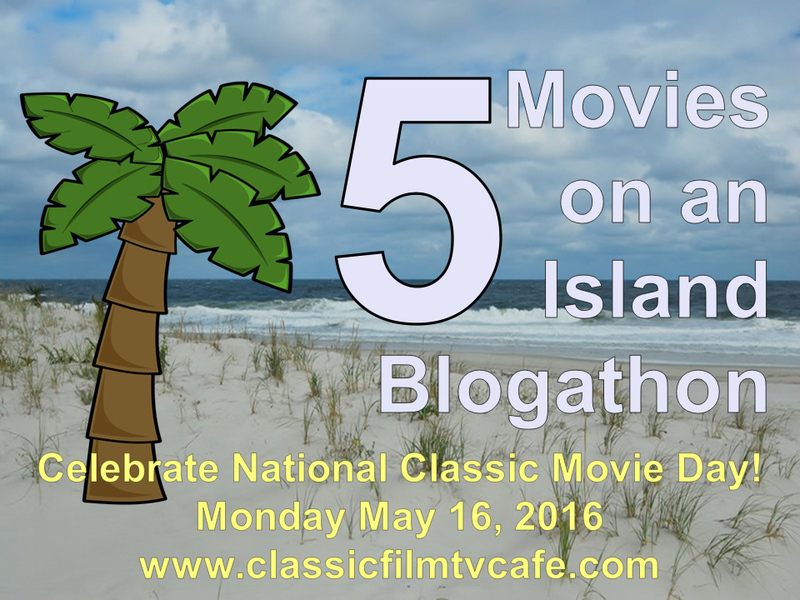 Its operatic melodrama also creates a far more emotional story that enriches the familiar Gift of the Magi plot. It's also interesting to see how this classic story written by the great American author O.Henry is adapted in Finland for international TV audiences. I think it translates well. If you've been following along on the blog, you know that I've been reminiscing about some of the best and most interesting adaptations of O. Henry's short story The Gift of the Magi. So far I've discussed the 1952 film O.Henry's Full House, the 1978 TV movie The Gift of Love, and a segment within 1999's Mickey's Once Upon a Christmas. 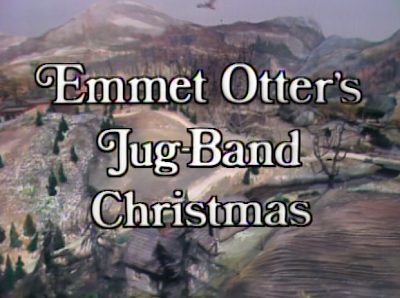 Today's blog post is about another adaptation, 1977's Emmet Otter's Jug-Band Christmas. This hour-long TV special takes quite a few liberties with the details, however the heart of the original O. Henry story is all there. 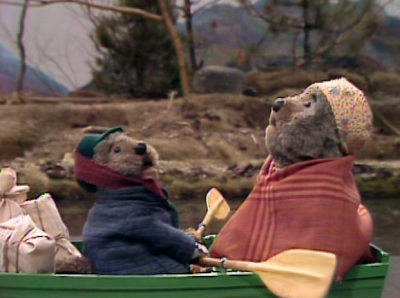 Emmet and his mother sing "The Bathing Suit That Grandma Otter Wore" as they row their boat from Frogtown Hollow to Waterville. Emmet Otter and his widowed ma, Alice Otter, live along the river just outside the town of Waterville. Emmet does odd jobs and home repairs while his mother takes in laundry as both struggle to earn a living. When a Christmas Eve talent show in Waterville is announced, both Emmet and Ma Otter think they each stand a chance to win the money and buy the other a Christmas present this year. 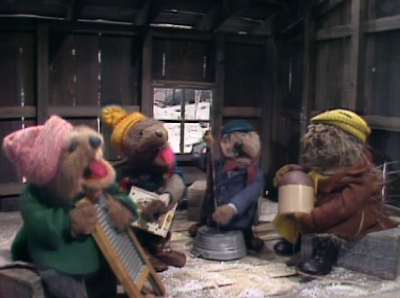 Emmet and his friends Harvey, Charlie, and Wendell form a jug band and rehearse the song "Bar-B-Que" in the tree house before the talent contest. However sacrifices are required in order to enter the talent contest. Emmet will have to poke a hole in his mother’s wash tub in order to have an instrument--a washtub bass--to join his friends performing in a jug band. Ma sewing her costume for the talent contest. Ma will have to hock Emmet’s tool chest at a local pawn shop in order to buy the fabric to make a fancy dress in order to sing in the show. In the spirit of O.Henry’s classic tale, the otters each surrender a precious possession in the hopes of creating a happy Christmas for the other. In the talent show, the boys perform the song "Brothers" as a last minute change. At the talent show, many acts perform and another performer sings the song "Bar-B-Que" before Emmet's jug band! So the boys quickly come up with another song, substituting "Brothers" into the act. 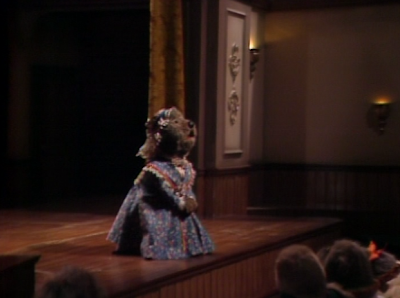 In the Talent show, Ma sings the ballad "Our World," one of Pa's favorite songs. 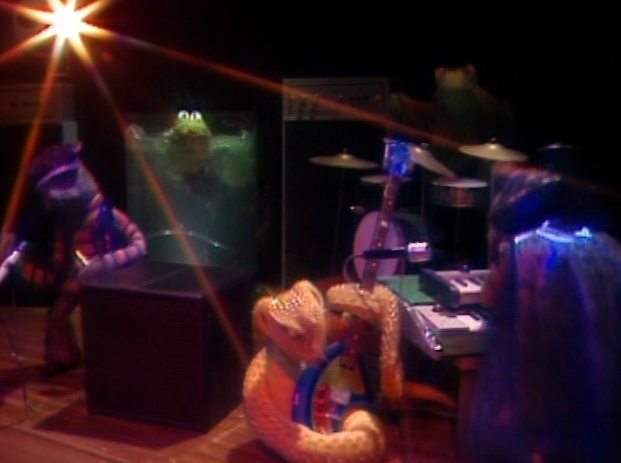 While Ma's and the jug band's performances are quite popular with the crowd, both acts lose the contest to a rock band calling themselves The Nightmare, performing "River Bottom Nightmare." You gotta love The River Bottom Nightmare Band which includes a snake that plays the bass and a catfish in a tank that provides back-up vocals. 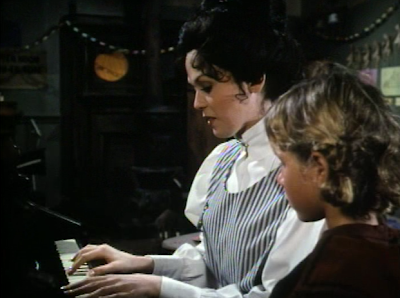 After the contest, Emmet reveals he wanted to use the prize money to put a down payment on a piano for Ma and she says she wanted to buy Emmet the guitar he wanted. Ma says "That's the nicest present anyone ever tried to give me" as she hugs her son. Waking home from the talent show on Christmas Eve, Ma and the jug band combine both of their songs and sing "Our World/Brothers" to create a much better song together. Hearing the beautiful new composition, a local restauranteur hires the act to play every night for money and free food--a better deal than the one-time cash prize of the talent contest! 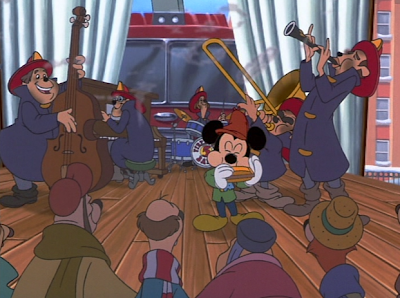 Doc Bullfrog hires the jug band and Ma to entertain in his restaurant. This is an utterly charming live action TV special created by the genius puppeteers of Jim Henson Productions. 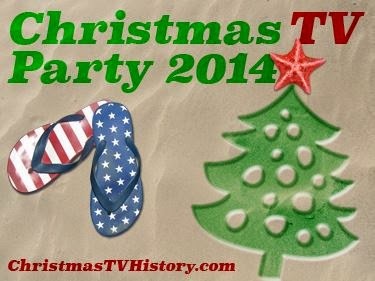 It is not only a Christmas classic but arguably one of the best things TV has to offer. Not only does it feature the highest quality puppets and character development but amazing detail in the the set design and the creation of this unique environment. Frogtown Hollow, where the Otter family and their friends live, is awe-inspiring. Not only do Ma and Emmet row their boat through real water but the fireplaces feature real flames. 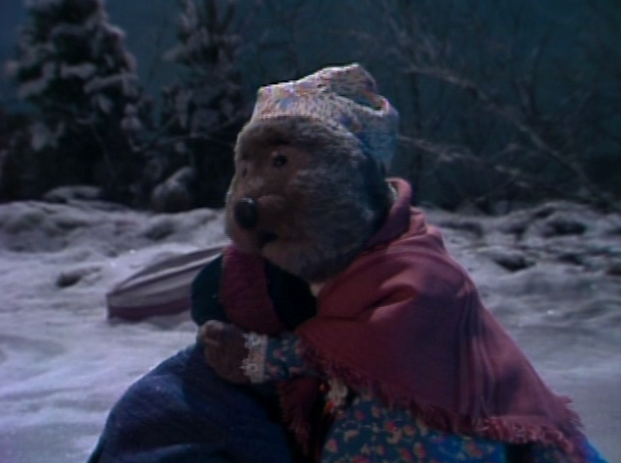 The townsfolk are made up of otters, badgers, woodchuck, bullfrogs, fish, snakes, and even a bear--all dressed in many layers of winter clothing to keep warm. My favorite detail is the life-like water fowl that populate the river that include swimming ducks, a crane, and even flying birds. Remember, this is all done with puppetry! Modern fans of Jim Henson's Muppets shouldn't overlook the this earlier production and its overwhelming attention to detail and story. 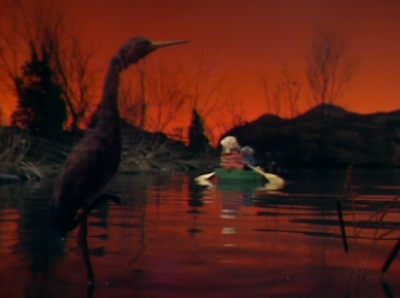 In the foreground, a crane stands on one leg as Ma and Emmet paddle their boat in the sunset back towards Frogtown Hollow. 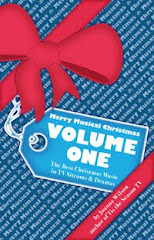 The memorable music is written by legendary songwriter Paul Williams and includes "The Bathing Suit That Grandma Otter Wore" a song sung by Emmet and his mother in the rowboat at the beginning, "When There Ain't No Hole in the Washtub" sung by Emmet, the foot stomping jug band performance of "Bar-B-Que," the gospel-inspired "Where the River Meets the Sea" sung by Emmet and his mother, Ma’s song "Our World" that she sings in the contest, "Brothers" the jug band's song in the contest, the heavy metal rock and roll song "River Bottom Nightmare," and "Our World/Brothers" the song that earns the jug band and Ma their gig at the restaurant. 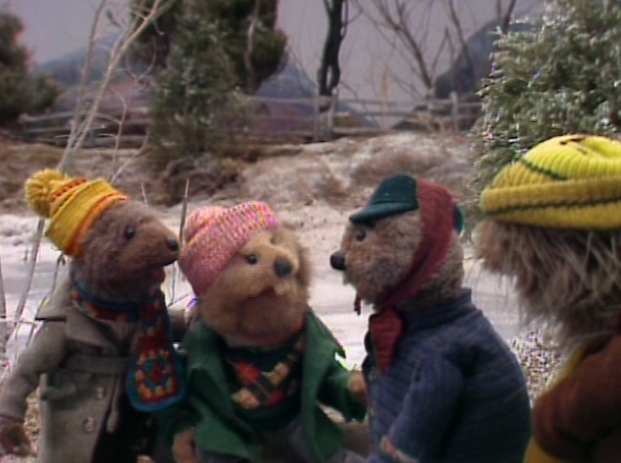 The attention to detail is astonishing in this TV special--each of the puppets wears several layers of winter clothing. Though this adaptation of The Gift of the Magi reinterprets newlyweds Jim and Della's gift exchange for an otter mother and a son that don't end up exchanging gifts at all, you'll still be pleased with the outcome. 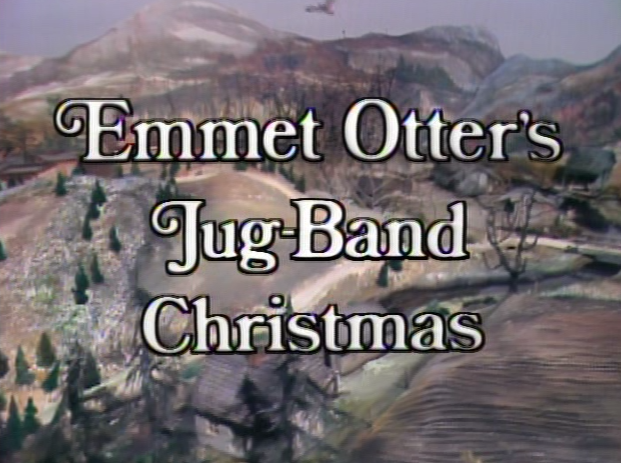 Emmet Otter's Jug-Band Christmas shares a story that at its heart is about love at Christmas time, a story even O.Henry would be pleased with. 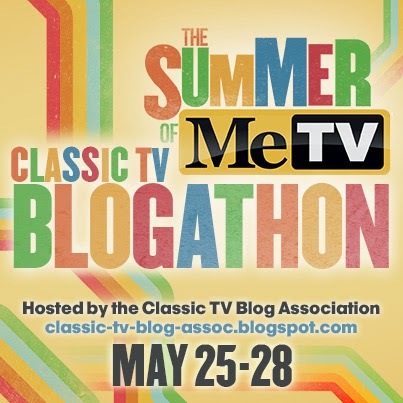 If you're as big of fan as I am of this classic TV special, you're sure to remember this song "Bar-B-Que" performed by Emmet and his friends in the jug band, rehearsing for the talent contest in the tree house. 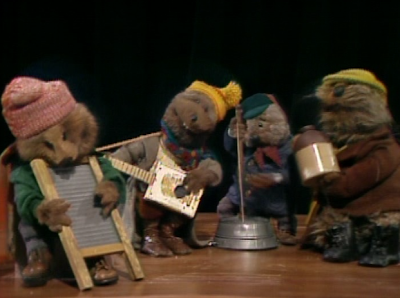 "We're not birds, we're a jug band!" 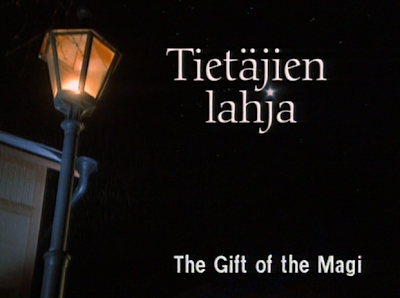 Even the title of this adaption of The Gift of the Magi suggests this version's emphasis on romance. 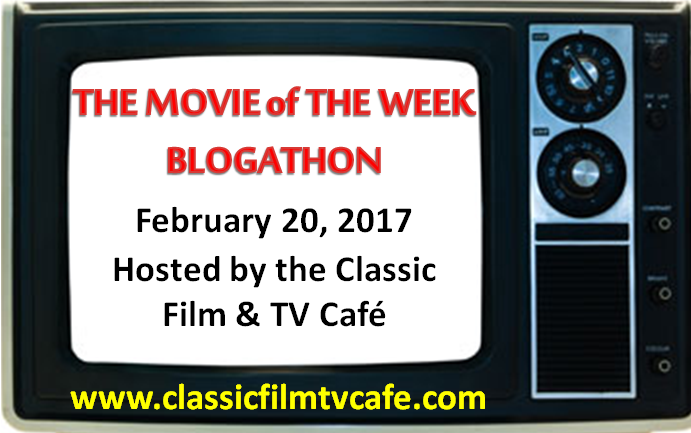 Last week, I posted about the 1952 movie O.Henry's Full House, a movie with two vignettes adapted from a Christmas short story. Click HERE to return to that post. 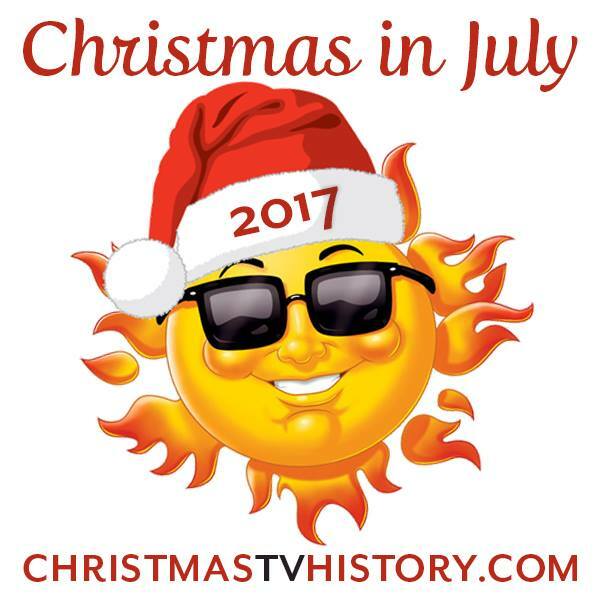 Most of us are probably familiar with O.Henry's short story The Gift of the Magi--its themes and plot are frequently adapted for Christmas movies, TV specials, and series' episodes. 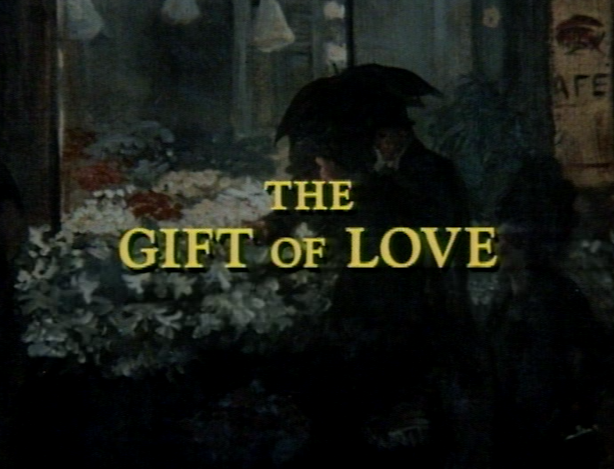 One outstanding example is the 1978 made-for-TV movie The Gift of Love starring Marie Osmond, Timothy Bottoms, James Woods, David Wayne, and June Lockhart. I'm in love with this movie just for its amazing and talented cast! 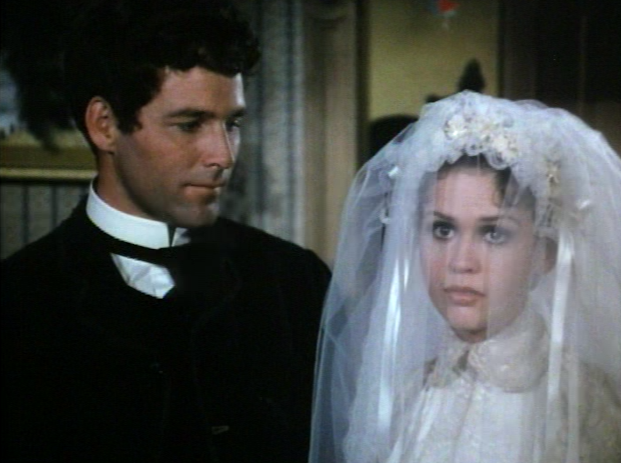 Marie Osmond stars as Beth and Timothy Bottoms as Rudy Miller. Here they are ice skating in New York's Central Park at the turn of the twentieth century. The Gift of Love expands on O.Henry’s original short story to include the couple's first meeting, courtship, and falling in love before ending with the familiar gift exchange. This TV movie adaptation focuses on the unlikely romance of the couple falling in love despite Beth's privileged, wealthy background and Rudy's lower class status as an immigrant from Switzerland. One of the obstacles they must overcome is that both already have arranged marriage partners. James Woods as Alfred. He would rather bird watch and lecture on his findings than marry--but he doesn't come off as a bad sort. Beth's fiancé Alfred is just as eager as she is to tell their families that they aren't happy with the arrangement. Alfred would rather concentrate on his ornithological career which would require him to travel the world. Beth of course would rather follow her heart than allow her aunt and uncle to broker a union on the basis of a financial arrangement. Another obstacle to Rudy and Beth coming together is that she deceived him when they first met. Beth led Rudy to believe she was a maid as to appear more in keeping with his own social standing--and she continues this lie when they meet again at the Butler's Ball where they share a dance. 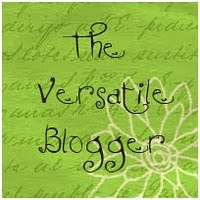 Against her family's wishes, Beth marries Rudy even though it means losing her inheritance. Leaving behind her wealthy family, the two are married on Christmas Eve and the sacrificial gift exchange of the watch fob and the hair combs serve as both holiday presents and marital gifts. In this version, Beth's sacrifice is made even greater as she gives up her family's inheritance and social standing in order to be with her true love. And, Rudy's sacrifice is greater in that he gives up returning to his home in Switzerland where his father is a Bürgermeister with power and influence. By marrying Beth and staying in America, Rudy too is choosing love over his family's privilege. Beth volunteers her time at a Settlement House for newly arrived immigrants. Beth watches the children while their mothers go to work. The Gift of Love is special because viewers have two opportunities to hear Marie Osmond sing. She sings “The Gift of Love” at the beginning of the movie seated at the piano, and later Beth performs the song again at the Settlement House for one of the young children. The song Beth explains is a special one to her because it was written for her by her father and he sang it to her every Christmas in the years before he died. 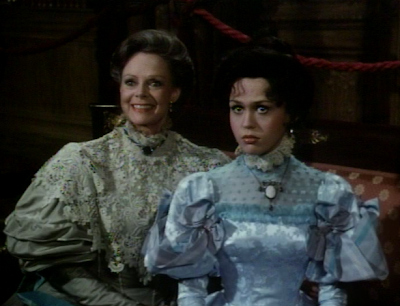 Actress June Lockhart plays Beth's Aunt Constance. 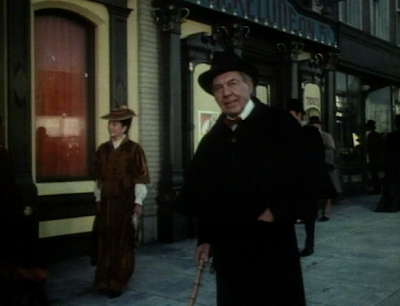 Actor David Wayne appears in the movie as the author O.Henry who narrates the story. In addition to June Lockhart as Beth's Aunt Constance, this movie also casts actor David Wayne as O.Henry, its narrator. 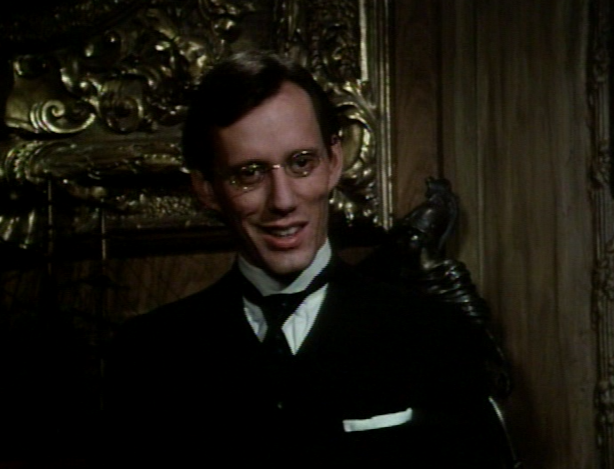 David Wayne also plays the friend Horace in The Cop and The Anthem segment in the movie O.Henry's Full House. The Gift of Love takes many liberties in its adaptation of the original The Gift of the Magi, most notably changing the main characters' names from Jim and Della to Rudy and Beth. 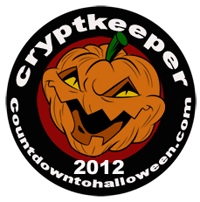 Interpreting a short story into feature length will also bring about changes. However, this movie is perfect if you want to feel the romance of the sacrifice over the twisted irony of the sacrifice. 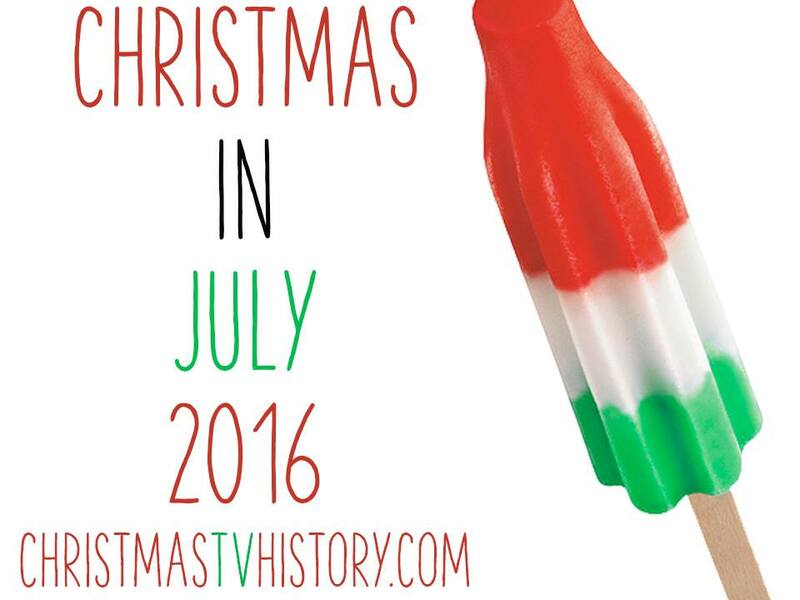 These changes make this Christmas movie's story renewed and somewhat novel. I'm entertained each time I watch it. Are you as impressed with this movie's cast as I am? 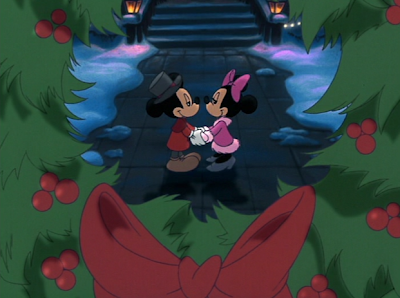 What's your favorite romantic Christmas TV movie?